A step-by-step of a glorious spring cleaning event - refilling my watercolor palette. Because there is nothing like a freshly filled palette to inspire some fresh work. If you are starting your palette from scratch, here a tutorial on How to Create a Watercolor Palette. Remove each half pan from your palette and lay them out in a lovely rainbow-colored order to optimize your filling experience. Gather all of the watercolor tubes you want to add to your palette. In my case this was a mix of the existing paints in the palette and some new sets I’ve collected this years. Match each paint to it’s half pan, using the label that you diligently Sharpied on when you first created the palette. Gather some new half pans to add to the mix, if you’re adding paints to the palette. Labelling is KEY if you ever plan to refill your palette. I put the brand initials on one side and the color number on the other. A lot of the older paints I have are too dry to be squeezed out of their tubes. When this happens you can cut the tube into little rectangles and peel off the sides and pop the dry paint into the half pan. It re-activates with water! 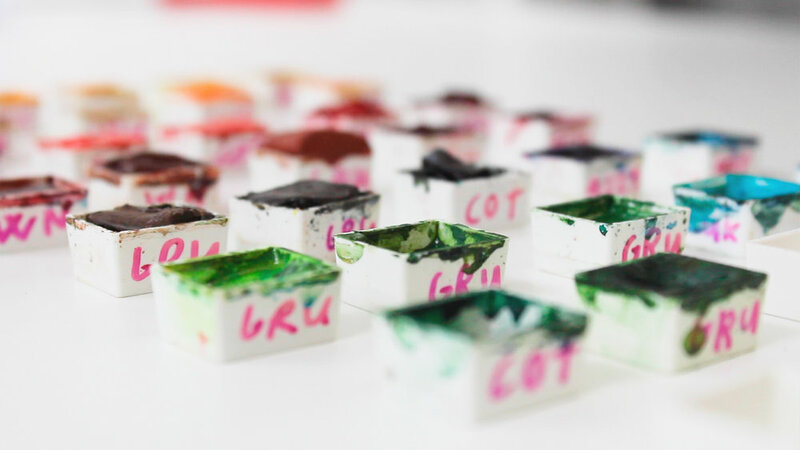 Although the process of extracting the old watercolors from their tubes is messy and takes patience, it is worth it! Because a little watercolor goes a long way. I started with the old paints and then ended with filling up the half pans with new paints. I usually fill them up almost to the brim. Organize the half pans in any order you fancy. I like the spectrum, personally. Then click them back into your palette. The beauty of these types of palettes is they are fully customizable - you can take things out, add things in and re-adjust any time you like. It’s always a good practice to test out the paints in your palette. You can see how the colors paint and how they dry on the paper. I rarely revisit this key, but I do feel that I know the palette better once I do it.